Abbott has voluntarily recalled its Similac Brand Baby Formula because evidence of beetle larvae has been found in several containers. Imagine feeding your cute, little, adorable baby beetle larvae – yes, very gross and very upsetting and incredibly scary for mothers. I know the reaction in my household has been one of inconvenience, annoyance, and fear. My wife is not happy. How does beetle larvae enter the production process and result in contaminated baby formula? What would their 5 Why exercise look like? Amazon Mom is a free membership program aimed at helping parents and caregivers, from the prenatal days through the toddler years, use Amazon to find all the products their family needs. To join, simply sign into your Amazon account and tell us whether you are a Mom, Dad, or other caregivers of a child. By providing some optional information about your family, you can help us personalize offers, e-mails, and product recommendations to help you find exactly what you need at just the right time. Amazon Mom members receive benefits such as 30% off diapers and wipes, FREE Two-Day Shipping with Amazon Prime, as well as exclusive offers via e-mail. We have a 9 month old infant and we purchase baby formula – yes, Abbott Similac Baby formula – from Costco. As such, we buy A LOT of formula because Costco sells in bulk. That means a bunch of baby formula that we’ve bought is now waste. And, our infant, who is normally really happy, has been very irritable the last several weeks and has had a fever this week. Now, we are concerned whether her irritability and fever is related to the Abbott Similac Baby Formula. And more: how long has Abbott known about this infant formula beetle larvae contamination? If it’s been a while, then that means we’ve been feeding our baby contaminated baby formula FOR MONTHS! 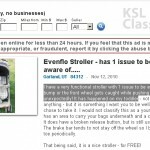 From a reputation and branding perspective, is Abbott doing enough to win the hearts and wallets of mothers across America? 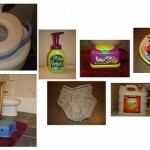 Based on the numerous videos I’ve included on this post, there are some very, very, very mad and angry mothers. Be sure to check out the videos below of moms speaking with Abbott Customer Service. So, I went to the Abbott website to check if the infant formula we have is contaminated with beetle larvae. Answer: yes, all of our infant formula is contaminated with beetle larvae. Great, several hundred dollars worth of our baby formula is now garbage. How can I get my money back? I completed a form with my address, lot number, and then Abbott will send me a FEDEX box where I will return all of our formula. Once Abbott receives the recalled infant formula, they will then reimburse us, which could take 4 – 6 weeks. Abbott is initiating a proactive, voluntary recall of certain Similac-brand, powder infant formulas in the U.S., Puerto Rico, Guam and some countries in the Caribbean. Abbott is recalling these products following an internal quality review, which detected the remote possibility of the presence of a small common beetle in the product produced in one production area in a single manufacturing facility. The United States Food and Drug Adminstration (FDA) has determined that while the formula containing these beetles poses no immediate health risk, there is a possibility that infants who consume formula containing the beetles or their larvae, could experience symptoms of gastrointestinal discomfort and refusal to eat as a result of small insect parts irritating the GI tract. If these symptoms persist for more than a few days, a physician should be consulted. Certain Similac powder product lines offered in plastic containers. Certain Similac powder product lines offered in 8-ounce, 12.4-ounce and 12.9-ounce cans. 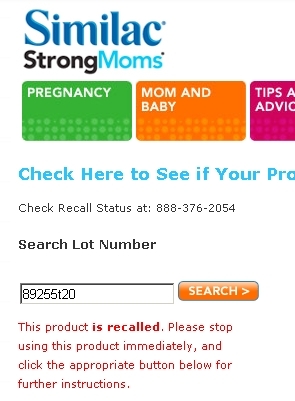 To immediately find out if the product in your possession is included in this recall, parents and caregivers should visit www.similac.com/recall/lookup, and type in their lot number to determine if their product is affected, or call (888) 376-2054. No Abbott liquid infant formulas are impacted. 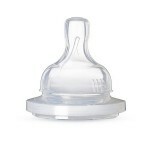 Products not involved in the recall include all Abbott Nutrition liquid ready-to-feed and concentrated infant formulas and all powder and liquid specialty formulas, such as Similac Expert Care™ Alimentum®, Elecare ®, Similac Expert Care™ Neosure ®, Similac® Human Milk Fortifier, and metabolic formulas for inherited disorders. The company is implementing a plan to address this matter in the affected manufacturing facility, which is expected to be completed shortly. No other facilities or products are involved in this recall. Abbott has consulted with the U.S. FDA regarding this recall. Products with affected lot numbers should be returned to Abbott at no cost to the consumer. Parents and caregivers can go to www.similac.com/recall/lookup or call Abbott’s consumer hotline, (888) 376-2054, 24 hours a day, seven days a week. Both the website and the consumer hotline have specific details on how to complete the return process. 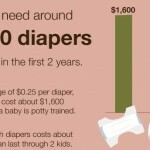 In addition to poor Abbott infant formula quality, how about their response to this? Are they doing enough to win the hearts and wallets of mothers across America? I find their process for granting the refund interesting: First they put out buggy formula (I’m not sure of the causal link between buggy formula and your daughter’s illness but am sympathetic to it….). 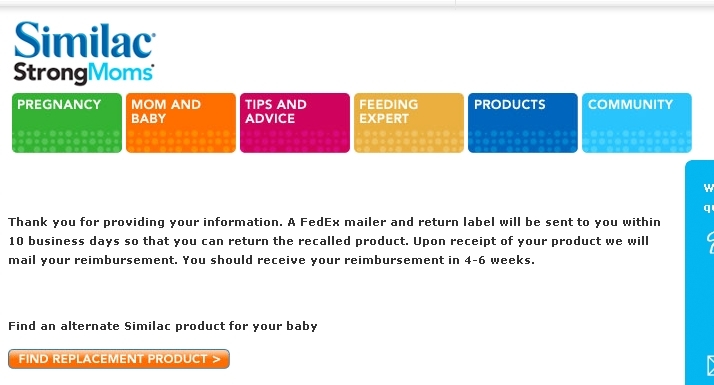 Once you found out about it after feeding it to your daughter for months (causal link or no, the thought of feeding buggy formula to my two year old grandson is enough to drive me to the competition), the process for getting a refund involves you ordering a FedEx mailer, mailing the stuff back and waiting a long time to get your money back. Meanwhile you lose the time value of the money (trivial as it is these days) while you wait, as your daughter does not stop eating as you wait for the recall machinery to work. It seems to me that the company could have won by simply taking you at your word and refunding the money. You would not have had to go through the procedure and eliminating the cost of shipping you the mailer and shipping the mailer back should have offset any fraudulent claims. You’d still have been hacked about the buggy formula but you might have even thought, these guys know how to run a recall! They could have responded with a coupon for replacement, reducing fraud further (hard to spend an infant formula coupon on whatever the fraudster would likely rather have). And they could have thrown something in for your trouble. In any case, there are much better processes to go through in a recall than forcing you to send in the unused portion and wait for your money to come. Hope your daughter gets well soon!